Hunting isn’t just about the kill. 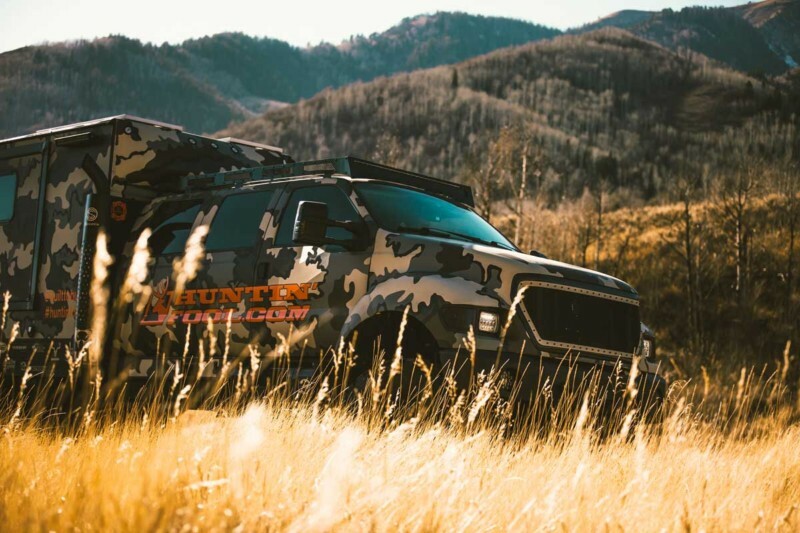 At Huntin’ Fool, everything we do, the reason for our existence, is to help you take your hunt to the next level. 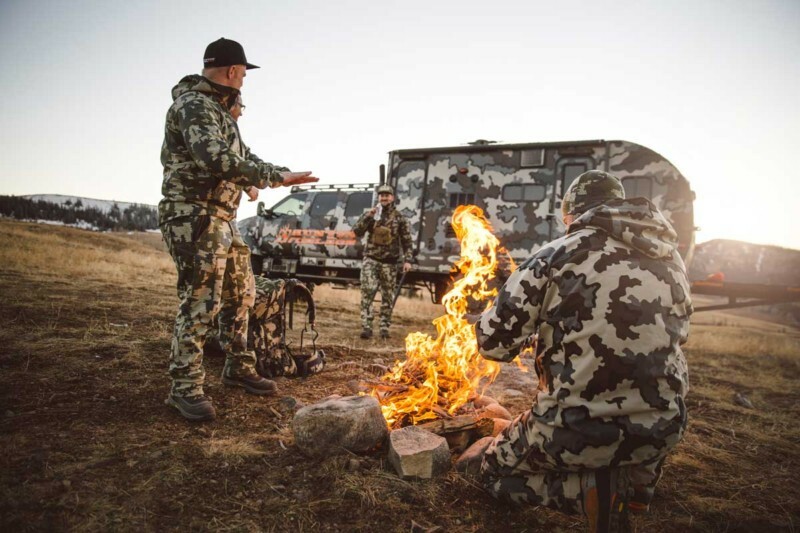 We provide you with the tools and proprietary data to find and acquire the best hunting experience available, help you prepare more effectively for that hunt, and give you a way to share your experience with a community of explorers and adventurers who are just as passionate about hunting as you. 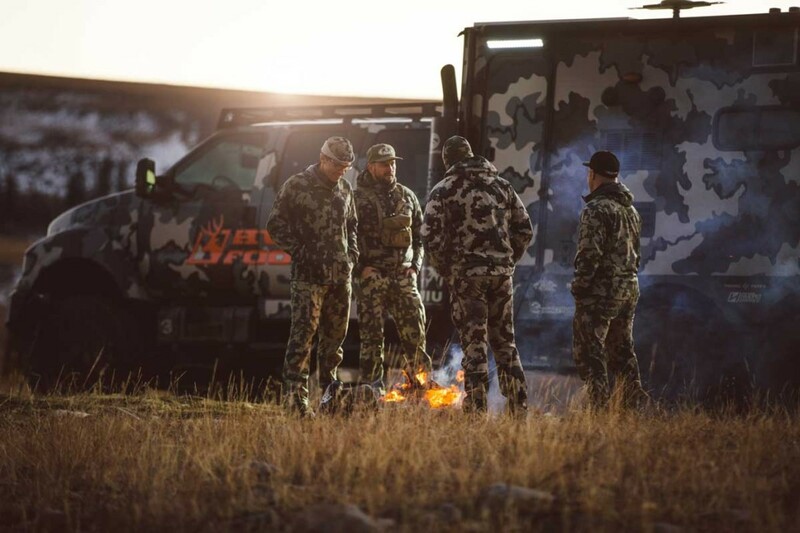 It’s time to Elevate Your Hunt. Check them out here. 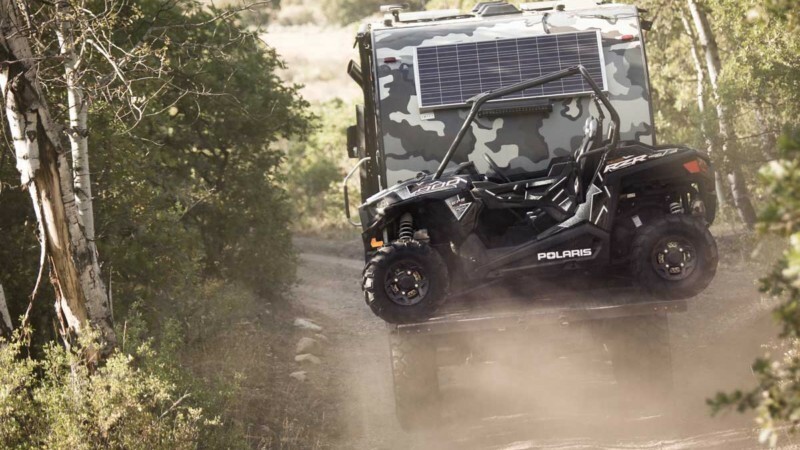 Capable of traveling over nearly any terrain and allowing those at its helm to live “off-the-grid” for over a week, this six-wheeled beast is any hunters dream. 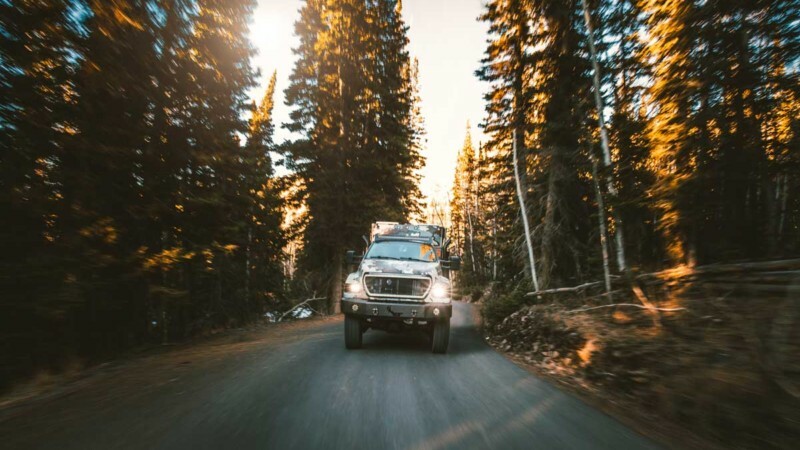 The stretched six-door F-650 (with “climb-through” access to the camper) offers seating for six in super cush BEARD Torque Bucket Seats – allowing its passengers to ride in style and keep them in place, even while bouncing over the roughest terrain. 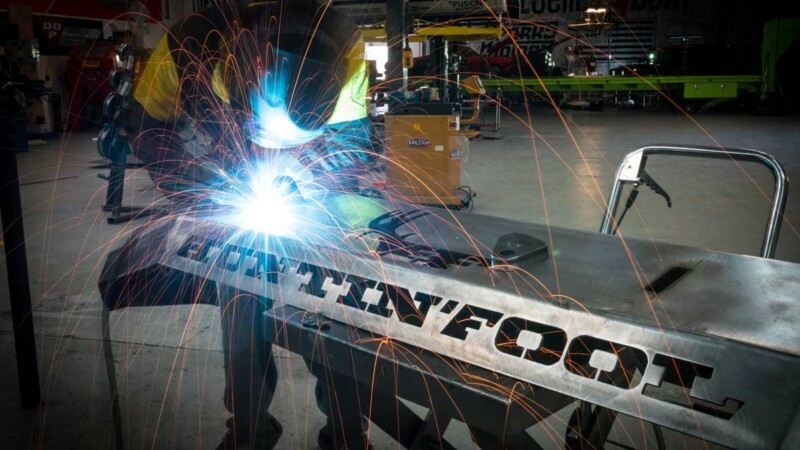 Behind the custom Sparks Motors built front bumper sits the 24 Valve 5.9L Cummins power plant that delivers through the Diesel Conversion Specialists Adapter to the Randy’s Transmissions built 5R110 with a PCS Tune. From the 5R110 Trans, the power is fed into a Ford 271F Transfer Case, and then runs straight into the SCS 1:1 Drop Case. There it’s split up and sent to the triple AxleTech 3000 axles. 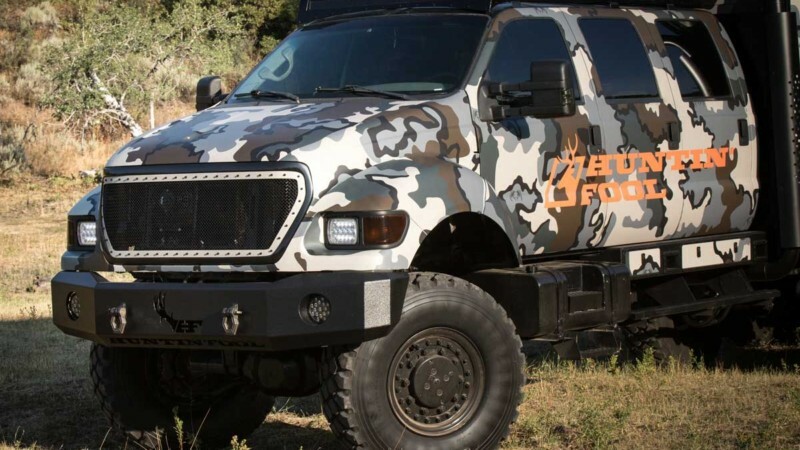 The power is finally put to the ground via 46″ Military spec tires. Black Rock Fabrication Brake Caliper Adapters come into play to stop all that rolling mass. 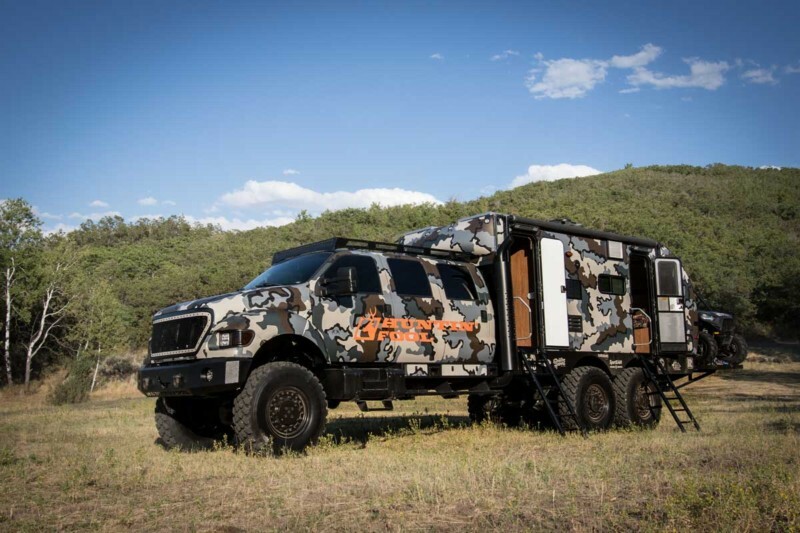 The camper portion is basically a stock camper that we stripped down and mated to the F-650 cab and frame. 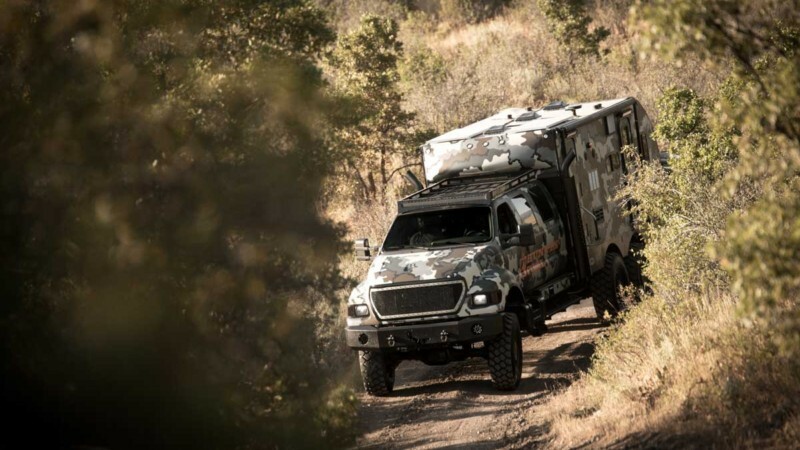 The exterior is outfitted with (4) 20″ DPG LED Light Bars and Dual DPG Reverse Lights to provide plenty of light over your camp. The camper utilizes a One Solar Panel and Battery Setup that can fully power the outfit for upwards of 7 days. The custom front bumper mentioned above was built in-house and features (2) 6″ DPG Flood Lights, and (2) Monster Hooks. Motorsports Manufacturing provides that clean front end look that we just can’t get enough of. 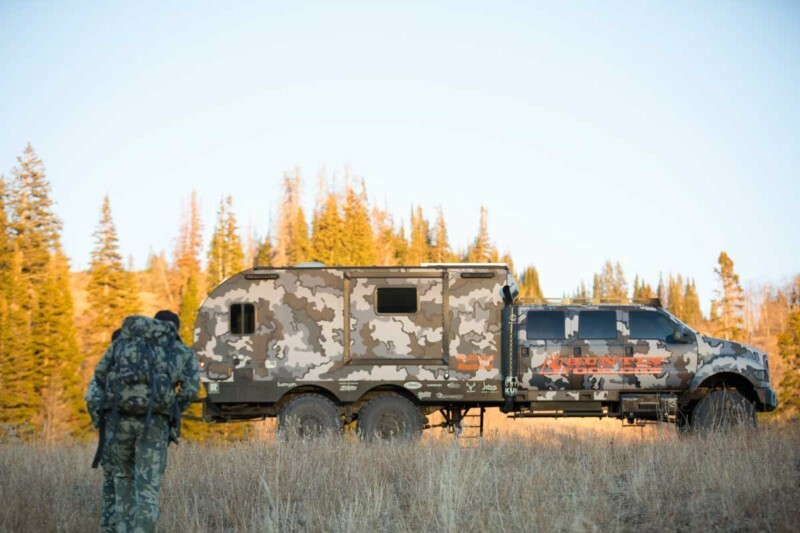 The cherry on top is the removable UTV Hauler Rack that easily attaches to the rear of the camper, making it truly an all-in-one setup that’s more than ready for any hunting trip or outing. Let us know what you think of this build in the comments below! 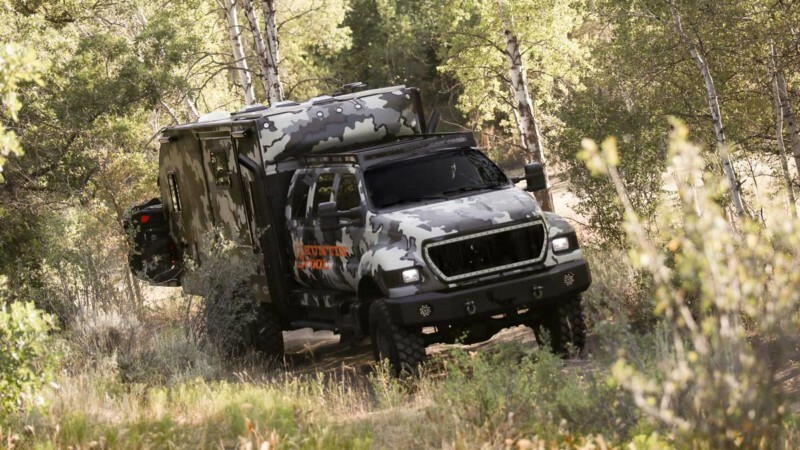 This is one of my favorite builds because not only is it a Hunting Fool truck but will also make the perfect bugout truck. There’s only one thing that I would have to add, the walk in safe that I bought from military surplus. 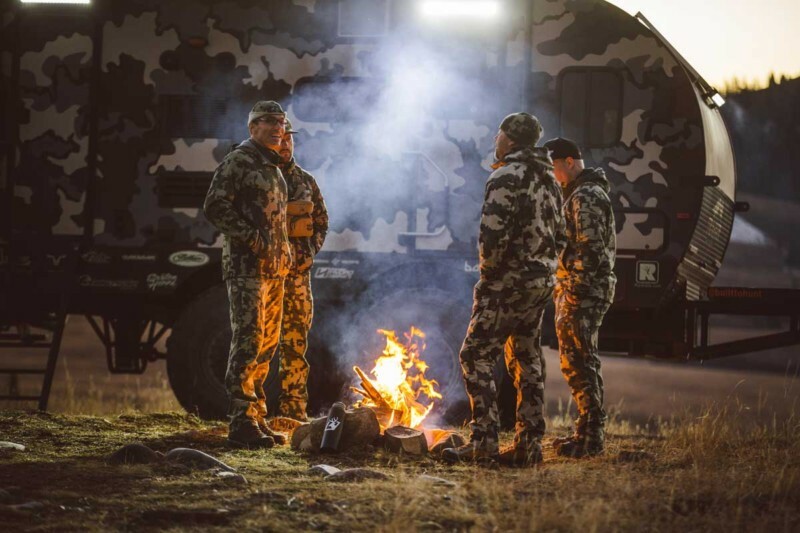 I would have to build a specially made trailer to hold the 5 ton 12×18 biometric safe that contains 71 ARs, 35 AK-47s, 19 sniper rifles, 40 scoped hunting rifles (22 mag-375 H&H), 50+ rifles from the 1880s-WWll, 85 pistols (majority 1911s). 70% of these firearms were left to me by my grandfather (that received a Silver Star, 3 Bronze Stars, and 5 Purple Hearts during WWl), my mentor and close friend that taught me how to be a gunsmith (he passed away in October after a long fight with Cancer at age 89), Many firearms left to be worked on but customers never picked them up, and then ARs that I’ve built using 80% lowers and sniper rifles using Sako and Remington 700 actions. I try to build precision rifles for competition yet a durable rifle for law enforcement and military roles. 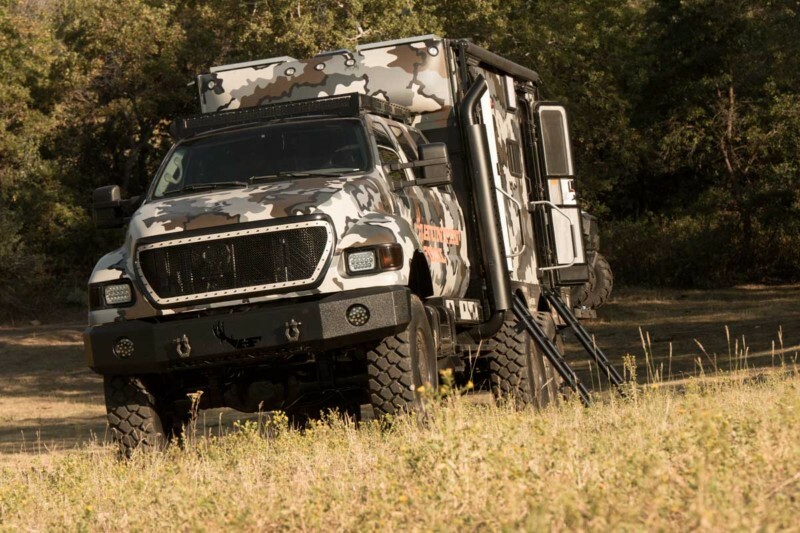 This is another dream build, to be completely honest, I haven’t seen a single build from yall that wouldn’t be a dream truck for me. The government and a crap load of people have turned their backs on me and other veterans, I only hope someone will actually show me that my Marines didn’t die in vain and that my injuries were worth the sacrifice. Thanks again guys. SEMPER FI!! 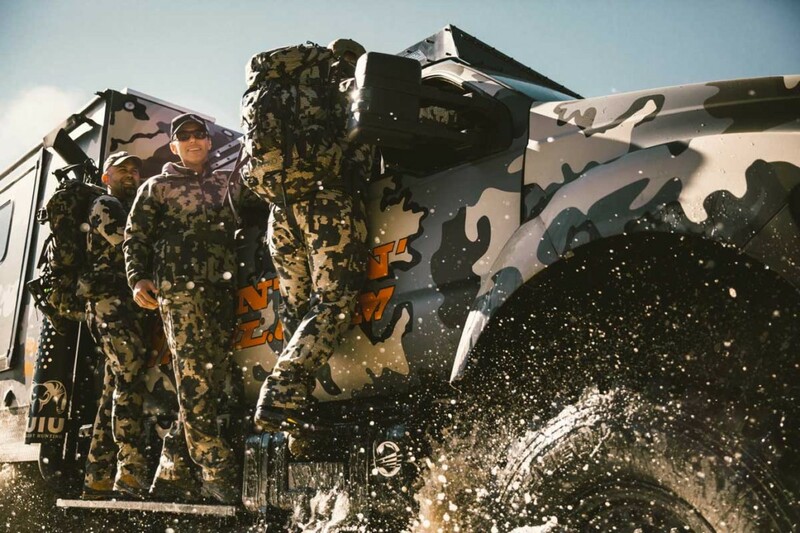 If you visit dieselpowergear.com, there is a link to the official rules at the bottom. It will tell you how to enter without making a purchase. Great build. Watch your show religiously and love all the builds y’all do. 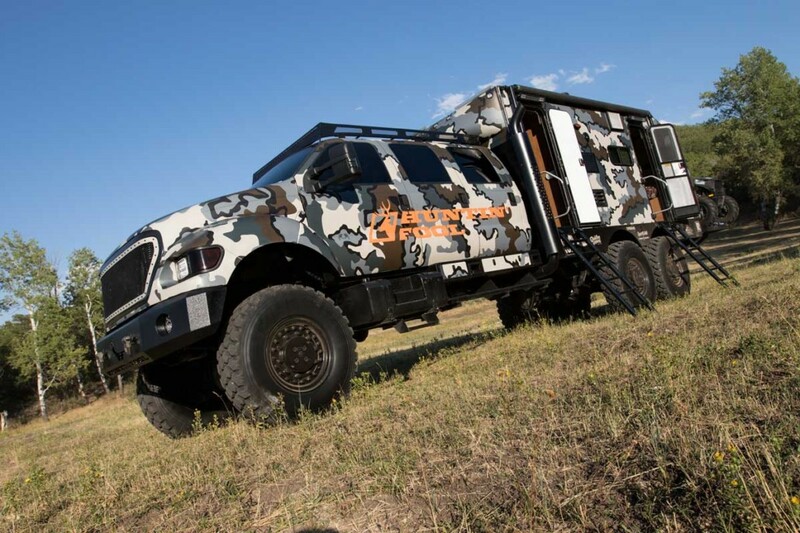 Would be awesome to ride in any of your trucks. RIGHT ON!!!!! Just started watching your show Diesel Bros, you guys are awesome totally changing the game! You guys make me wanna rethink everything and go strait diesel!!! I have to give a shout out for Hercules, sickest Chevy I’ve ever seen thanx to y’all. Why won’t you let uk 🇬🇧 viewers enter your compition s ?